Nearly 10 years on from the start of the Iraq War, Iraq as a political system continues to defy easy classification. It is neither the success story some voices in the Obama administration would like to claim, nor the complete disaster referred to by a growing number of critical pundits – ranging from opponents of the war to those who think the American occupation just wasn’t thorough enough. With respect to the exaggerated optimism in some corners, the fact that the country is not falling apart does not mean we are seeing a functional democracy in Iraq. Anyone who revisits the “benchmark legislation” goals for national reconciliation that emerged during the Bush years will find that Iraq still lacks an oil and gas law, a supreme court law and a revised constitution which is supposed to create a second federal chamber of parliament. And the problems do not stop with that either. In August, parliament did adopt some changes to the local elections law, supposedly in a move to have the legal framework ready for local elections by early 2013. But the fine print tells a different story: The revisions passed by the Iraqi parliament fail to address a specific distribution mechanisms for “surplus seats” that was ruled unconstitutional by the supreme court as far back as in summer 2010. Instead – and perhaps somewhat symptomatically – the few changes that were made by parliament related to the representation of small ethnic minorities, including Turkmens who had previously not pressed for minority seats outside of their area of territorial concentration in Kirkuk. Kirkuk of course, under a quintessentially Iraqi arrangement, was exempted from local elections as far back as in 2008 because no one could agree on the rules for the elections there; this problem has yet to be solved too. Changes to the important provincial powers bill were agreed by the government in August but have been met with hostility by deputies for provinces interested in greater autonomy, like Basra and Najaf, and have yet to be passed by parliament. There are also outstanding issues relating to financial affairs after Prime Minister Nuri al-Maliki decided to camouflage his unhappiness with parts of the 2012 budget through the introduction of a brand new infrastructure bill that also has yet to be passed. Finally, the essentially stalled nature of Iraqi parliamentary politics was only underlined by a recent decision to “agree in principle on the introduction of a proposal for a law for the senate”, even though a final settlement of the matter with the required constitutional amendments seems as distant as ever. Today, parliament is once more on holiday and Maliki has used the opportunity to further centralise power through getting rid of a central bank chief and replacing him with someone thought to be more loyal to him. More parliament holidays are coming up towards the end of the year so it will soon be time to turn to the difficult discussions of the annual budget again. Meanwhile, though, those claiming that everything is doom and gloom in Iraq will also face problems in their narrative. Despite the polarising impact of Sunni-Shia tensions in Bahrain, Saudi Arabia, Syria and Lebanon, Iraqi politics has so far failed to collapse fully along sectarian lines. Although there are reports of Iranian support for Assad continuing to flow to Damascus through Iraqi territory, Prime Minister Maliki has at least had meetings with elements of the Syrian opposition and has nominally signalled a commitment to change in Syria, including constitutional change. A landmark Arab League meeting was held in Baghdad in March and was somewhat more successful in terms of attracting the poorer Arab states than critics maintain. Iraqi oil output remains steadily growing, even if the numbers are less spectacular than some analysts had predicted. Half full or half empty, the underlying political dynamic here remains a matter of concern regardless. Back at the beginning of this year, there seemed to be some hopeful signs that Maliki finally understood that his pragmatism with respect to employing people with ties to the former regime in his bureaucracy needs to be complemented by some inclusion of them in his political coalition too. Turkey’s increasingly heavy footprint in the Kurdish parts of the country may have pushed in the same direction of finding (Sunni) Arab allies in the disputed boundary areas in the north that Maliki can work with. However, the trends during the course of the year – Maliki’s failure to co-opt defectors from the Sunni-dominated, secular Iraqiyya party (who at one point were in plentiful supply), the increased focus on small groups as minorities rather than as potential nationalist alliance partners (the case of the Turkmens), and the renewed attention to a possible Shiite-Kurdish deal on governorate boundaries (including possible changes to the Sunni-dominated Salahaddin governorate) – all indicate Maliki has not managed to exploit the momentum for building a less sectarian alliance that clearly existed in the first part of the year. Quite the contrary, Maliki’s latest failure to get parliamentary support for an enlarged independent electoral commission served as a reminder of his inability to build a more solid political support base beyond his fractious Shiite alliance. Among the drivers that will decide the outcome are developments in Syria and the regional policy of Turkey. One particularly interesting challenge relates to Turkish support for Iraqi Kurds who in turn advocate more privileges for Syrian Kurds than Ankara is prepared to accept. Perhaps the most worrisome aspect in all of this, however, is the fact that the Iraqi parliament’s failure to complete a mandated revision of the electoral law may play into the hands of those who want no change in the country. 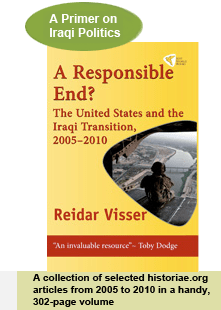 As such, it may serve as a pretext for delaying the local elections that are supposed to take place in early 2013, at a time when a shakeup at the local level is perhaps one of the few things that can create some dynamism in a stalled Iraqi political process.